Question: Who owns this dilapidated home on historic Albert Street? If you live in Alexandria, you should drive by the place; it is directly across the street from the City’s Public Safety Complex, and, unfortunately, it looks much worse in person than on Google Maps. I know who owns this because I actually went to look it up. While it meets the age requirements for historical I didn’t know it had been declared as such. I’m curious – are you now going to begin to post pictures of other neglected “historical” homes in our area to draw attention to the need for us to preserve them or is there another reason for this post? Personally, I hope it’s to draw attention to the fact we’re losing our history every day. I have been approached within the past few weeks to come up with a plan to save perhaps what may be the oldest home in our area. It’s in much worse shape than the home you have posted here. The reality for my project will be can it be done in a manner which is financially feasible for the owner or will Alexandria simply lose another piece of history. Currently the City has no assistance available to owners of historical property. The assistance available is through federal and state programs. If the City is serious about saving these type properties, perhaps the candidates need to formulate a plan to protect and save them. I’m betting it is a petty and vindictive reason. Rhonda, with all due respect, I never claimed the home was “historical;” it may be older than 50 years, but so is the shed in my neighbor’s yard. I’ve written about and drawn a lot of attention to our endangered treasures, and I haven’t ever ridden the fence about the issue. A person should not claim to be a champion of a neighborhood when the only property in the neighborhood they own is condemned and in disrepair. And sorry, I don’t believe negligent property owners, particularly those who buy single-family homes as investment properties, should be entitled to City-funded incentives. In my opinion, there are much more pressing needs, and as you point out, for responsible and qualified property owners, there are already state and federal programs for historic preservation. To me, as far as this subject is concerned, there’s nothing worse than someone who would publicly promote preservation while working hand-in-hand with an owner who seeks to demolish an historic property; it’s vituperative and dishonest, a form of collective blackmail against anyone and everyone who champions preservation. Shameful. Duh!…I have been promoting this idea for several years…..
Are we just now waking up to this??? Wasn’t that a law office at one time? Glynn Reynolds, I think. Not a residence. I pass by that every day and wondered the same thing. It seems to be in good shape. I have kicked ideas around in my head for a reuse of the building. The City of Alexandria’s Historic Preservation Commission advocates for properties every year. 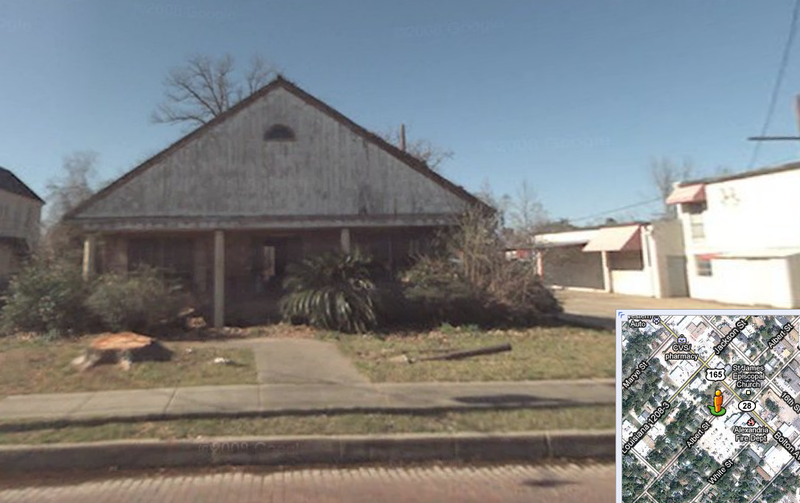 Every year they nominate (with the Historical Association’s help) at least five properties in Cenla for the Louisiana Trust’s Ten Most Endangered List. If the property’s nomination is accepted, it does shine a light on the property for a little while. Unfortunately, it is up to the owner to do something with the property, or to sell it. Most of the time, they do neither and it still sits. Look at the Hargis mansion on my street. It is sad. Such a beautiful building and it is rotting with boarded up windows on 3 acres of land (which is unheard of this close to downtown). I have submitted, to my councilman and to Mayor Roy, the idea of making Florence Avenue a local historic district. It has to be voted on by the council. If it is made a local historic district, the State office more often than not, will help get it listed on the National Register. I have already talked to the people in Baton Rouge about this. Unfortunately, I do not think my councilman is interested in historic preservation. Maybe it is a new day? We need better preservation ordinances in this city.